Sullivan's Island is where Charleston's wealthiest families used to spend their summers, exchanging the busy city lifestyle for a more relaxed atmosphere with constant ocean breezes. Of Charleston's six beaches, Sullivan's Island stands out for its rich history and the beautiful low country style homes dating back to the late 1800s. In addition to historic beach homes, the palm trees interspersed with hundred year old live oaks create a setting that is unlike any other Charleston beach. Are you looking for specific features in a Sullivan's Island home? Try out our fully customizable search feature that lets you search for homes that fit your needs perfectly. Search Charleston area home listings by property type, home size, number of bedrooms, price range, and many other features. Sullivan's Island has the priciest beach real estate in all of Charleston. This is partly because there are so few condos or town homes on the island - you'll only find a handful of condos for sale at any given time. The majority of real estate listings are large houses built on spacious lots. Add a high demand to this comparatively low supply of options, and the end result is one of the most exclusive beaches in South Carolina. Real estate on Sullivan's Island is ideal for buyers looking for a historic home on the beachfront (or within a short walk of the beach) as well as buyers wanting to live in an upscale beach community without the distractions and high membership costs that come with the local beach resorts. 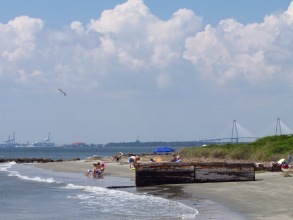 Sullivan's Island is the closest beach to downtown Charleston. In fact, you can see the city's skyline from the southern end of the island (shown below left). 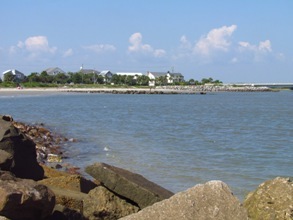 The beach on this southernmost section of the island is very calm since it overlooks the Charleston Harbor. You'll notice as you walk northward along the beach that the waves grow larger as the harbor turns into the Atlantic Ocean. Peninsular Charleston is just a 10 minute drive from Sullivan's Island, and the shopping, restaurants, and movie theaters of Mt. Pleasant are also less than 10 minutes away. 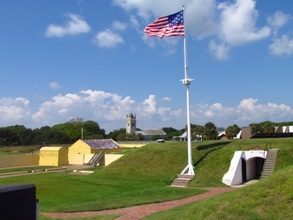 Strategically located along the Charleston Harbor side of Sullivan's Island, Fort Moultrie has a coastal defense history dating back to the Revolutionary War. While British cannons could easily destroy standard brick-and-mortar fortifications, the palmetto logs favored by the colonists could absorb repeated cannonades without shattering. This realization, and the successful defense of the island during the Battle of Fort Moultrie, gave South Carolina its official nickname of the Palmetto State and the distinctive palmetto design on its flag. About 50 years later, Edgar Allan Poe was stationed at Fort Moultrie while he served in the military (one of several jobs he held while still struggling to support himself as a writer). His short story "The Gold Bug" is set on Sullivan's Island and became one of his most widely read works during his lifetime. Although he only spent a total of about 2 years on Sullivan's Island, tributes to Poe can be found throughout, from the quirky Poe's Tavern (pictured below) to the Sullivan's Island branch of the Charleston Public Library (named the Edgar Allan Poe Library) to several street names (Poe Avenue, Goldbug Avenue, and Raven Drive). 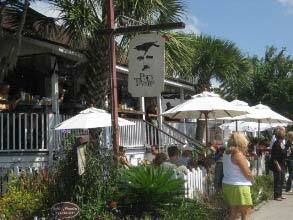 The downtown section of Sullivan's Island is very small, but it has a character all its own. You won't find any of your typical beach shops selling touristy souvenir t-shirts or beach towels but instead a basic gas station and some independent bars and restaurants. Home Team BBQ, Station 22 Restaurant, Off the Hook, Dunleavy's Pub, and Poe's Tavern are all located along Middle Street of Sullivan's Island. A 5-10 minute drive into Mt. Pleasant will give you tons of options for shopping and restaurants, from Target to Barnes and Noble to Moe's Southwest Grill. Sullivan's Island does not allow commercial development directly on the beach, and the residential real estate is zoned heavily to maintain one of the most natural beach settings you'll find in Charleston. There are no hotels, motels, or bed and breakfasts on the island since the town discourages transient lodging. However, Sullivan's Island has plenty of public beach accesses located throughout, making it a popular beach for Charleston residents to visit. One of our favorite beach accesses on Sullivan's Island is Station 16. From this central vantage point, you can see Fort Sumter, the Morris Island Lighthouse near Folly Beach, barges coming in and out of the Charleston Harbor, and the occasional shrimp boat in the Atlantic Ocean. If you walk south along the beach, you'll also see the steepled skyline of downtown Charleston and (just around the bend) the Ravenel Bridge. This is perhaps the most scenic stretch of beach along the island. Separating Sullivan's Island from Isle of Palms to the north, Breach Inlet (above right) is a popular waterway for boating and fishing. In 1864, its proximity to the Atlantic Ocean and the Charleston Harbor made it an ideal place for the submarine H.L. Hunley to begin its mission to sink the Union ship U.S.S. Housatonic. The Hunley's mission was successful, but both vessels sank in the process. The Hunley was recovered from the Charleston Harbor in 2000 and is currently being restored. The Sullivan's Island lighthouse is 1 of only 2 lighthouses in Charleston. 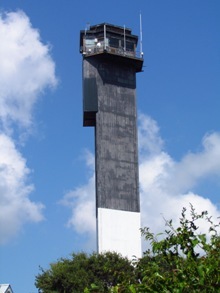 It was built in 1962 to replace the Morris Island lighthouse, which had fallen into disrepair and had become difficult to access. The Sullivan's Island lighthouse was the last lighthouse to be constructed by the Coast Guard, which makes it one of the most modern lighthouses in the country. The elevator granted personnel easy access to the top for maintenance instead of walking the spiral steps found in most lighthouses. The lighthouse stands at 140 feet, and its triangular structure is made of concrete with aluminum siding to protect it from the elements. The lighthouse itself is not open to the public, but visitors may walk the grounds surrounding it during the day. Sullivan's Island is known for its beautiful, historic beach homes with low country and plantation style architecture. Many of these homes were built in the late 1800s, and they offer a charm that is hard to find in most of the beach homes you see today. Double front porches and hundred year old live oaks are reminiscent of downtown Charleston, complete with colorful exteriors such as yellow, pink, and green. Vacant land lots are required to have at least half an acre (a rule that was first incorporated in 1817). Because the lots are so large - and also because Sullivan's Island is one of the oldest beaches in Charleston - it's difficult and expensive to find vacant land to build on. However, you'll find a good selection of newer homes that have been built in the past 15 years, and these newer homes have been tastefully incorporated into the older, historic context of Sullivan's Island. 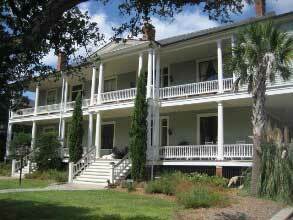 Sullivan's Island only has 2 main condo buildings – Island House and The Officer's Quarters. 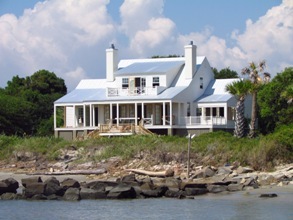 Island House (pictured below left) has the most affordable real estate on Sullivan's Island. 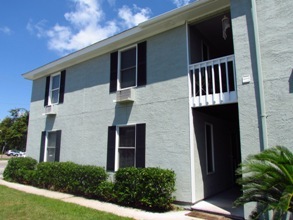 This condo building was constructed in 1973, and many of the units need cosmetic updating. Most of these condos have less than 500 sq ft and a window unit air conditioner, but this is about the only option you'll find for under $500K on the island. The Officer's Quarters (pictured above right) is a circa 1900 building divided into 6 condo units. Most of these condos have only 1 or 2 bedrooms, but you'll find gourmet kitchens, original pressed tin ceilings, beautiful mantles over the fireplaces, and large piazzas. No expense had been spared in renovating this historic building located within easy walking distance of the beach access at Station 18. With a history that belies its modest size of three square miles, Sullivan's Island has played an important role in the history of South Carolina and also the United States as a whole. 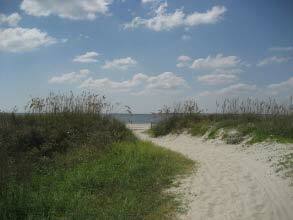 At heart, however, Sullivan's Island is relaxed and laid back with a small town feel. The emphasis on measured growth, combined with beachfront location and close proximity to downtown, has made housing costs traditionally higher on Sullivan's Island than in other Charleston communities, but the price is well worth it.